Approaching his death, Good Friday, 1931, the first Abbot of Saint Leo, Rt. Reverend Charles Mohr penned, As David prepared the way for a temple to the Lord but was not permitted to build it, and had to leave this work to his successor Solomon, so it seems that I too, having prepared the way at Saint Leo am not destined to do this work, but hope that like Solomon my successor will be able to build a temple to the God. His successor, Abbot Francis Sadlier, wasted no time embracing this mission. On November 22, 1932 at the scheduled meeting of the eleven chapter members of the Abbey, he introduced the resolution to begin, as soon as practicable, the erection of an Abbey church. At the same meeting he was forced to seek and obtain authorization to borrow $3450.00 to pay the semi-annual interest on the crushing debt left on the 1927 construction of the student dormitory, St. Edwardâ€™s Hall. Both Abbey and school were suffering, as was the entire country, in the throes of the Great Depression, but the monks of the Abbey shared with their Abbot the confidence that the Lord would provide, if it be his will. Already Abbot Francis was in contact with an underemployed architect of Tampa, Frank Parziale, who was willing to work in his spare time on a set of plans for the proposed church, to be paid for as the Abbot would obtain earmarked funds for the project. As U.S. President, Franklin D. Roosevelt was swept into office in November, 1933, on the platform of drawing a suffering nation out of its economic ills a glimmer of hope seemed to appear on the horizon for the dream of an Abbey Church. In early spring the Works Progress Administration was born and a San Antonio resident, Oliver Hoehn, an accomplished stone mason and builder from Ohio was employed by the WPA to train stone masons and brick layers for potential employment. Their first accomplishment was the still attractive native stone San Antonio Hall. At Saint Leo a tragic loss by fire of the Abbey auto garage supplied an unlikely push for the hopes of rebuilding of the abbey garage in fireproof material. Lakeland philanthropist and road builder, William P. McDonald, who owned and operated a limestone quarry near Brooksville, was approached by Abbot Francis to supply the limestone brick for the garage. This was mid 1935. In late August, as Abbot Francis stood in a garden spot to the west of Saint Leo Monastery and Hall, he was approached by a man just out of high school. â€œI would like to study for the priesthood, he was told. â€œYou have come to the right place, the kindly Abbot replied, Right here the Benedictine Fathers and brothers are soon to build an abbey church. We invite you to join us. The following summer of 1936, on the Feast of the Assumption of the Blessed Virgin Mary, Abbot Francis and his monastic community were joined by Oliver Hoehn, prospective builder, Frank Parziole, architect, and William P. McDonald, along with invited friends and guests of the abbey to participate in a solemn Mass in the Abbey Chapel, followed by a blessing of the ground for the abbey church-to-be. September 19, the staking of the building outline began. In late October, Mr. Hoehn had his first workers on hand for excavation of ground for the pouring of the foundation. All from San Antonio, they were: father and son Nicholas and Bernard Therres, Leo Burger, Michael Govereau, and Peter Dunne. Blessing the cornerstone of the aborning church was entrusted to the Most Reverend Patrick Barry, bishop of the Diocese of St. Augustine, the following April 4, 1937, during a solemn Mass he celebrated at the site on temporary planking. Presiding at the Mass was Abbot Francis. The Homilist for the occasion was Father Aloysius Dressman, from the abbey. In his address, Father Aloysius gave tribute to Abbot Charles, the initial advocate, who passed away six years previously almost to the day. He also gave tribute to Abbot Francis who put his predecessor’s dream into motion, and to those who had generously contributed to the work to date. He concluded: On this site arises the first abbey church of this state upon which the cross of Christ was planted, the cradle of Catholicism in America. Brick by brick, the abbey church grew daily, although sometimes slowed by lack of funds. The ambitious plans of Frank Parziole for a neo-classic Mediterranean design were scaled back in execution to a near austere Romanesque style. The nave, to ease the cost of construction, was shortened by thirty feet. Spurred by the celebration of Saint Leo Abbey’s 50th anniversary in 1940, contributions for construction increased and new personnel were added to the crews. Among them was Ray Therres, youngest son of Nick Therres, and thereby rests an unusual story. Ray, like his younger brother, Bernie, was born with a misshapen jaw, though rugged in physique and normal in every other aspect. As a student at Saint Leo prep he had excelled in all sports, especially in baseball. He was the star pitcher. Early in his employment as brick mason he was transporting materials on a thirty-foot high wooden scaffolding and lost his footing. Plunging head first to the concrete floor at the center of the chancel, Ray landed in a group of field crates normally used to haul oranges to the packing house. The watch from his pocket was extracted as he was lifted from the shattered boxes, shaped like a new moon by the impact. Carried into the abbey sick room he was diagnosed by the hastily summoned physician as mainly afflicted with a shattered jaw. Subsequent surgery, with replacement of his lost teeth, allowed him a perfectly normal jaw alignment. Shortly after hospitalization and recovery, Ray volunteered for service in the U.S. Army, serving with distinction and decorated with the Purple Heart in the Italian Theatre in World War II. After discharge from the Armed Forces Ray returned to San Antonio to marry and pursue a successful career. His bride, nee Gayle Alton, a non-Catholic, was previously married with three children. Through the Catholic Diocesan Tribunal, however, they were able to marry at St. Anthony’s Catholic Church. 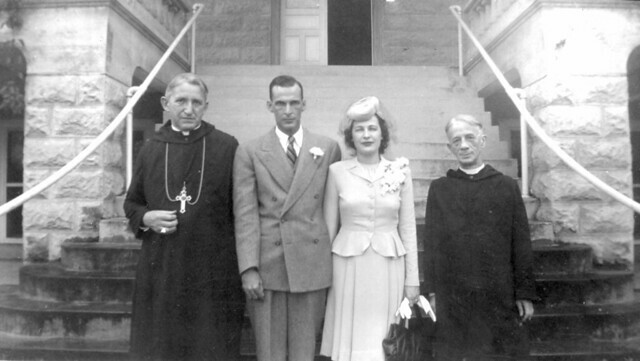 April 18, 1949, Gayle and two of her children, Diane and Joyce Smith, embraced Ray’s Catholic faith with Ray. By December, 1942, masonry work was completed with the exception of the bell tower. Ceramic tile and roofing had been installed and the interior, including doors, was trimmed in native red cedar, planed by abbey carpenters, Brother John and Placidus Stautner. The cedar trees providing the lumber were felled at the Saint Leo Abbey farm and rough hewn by the Jesse Jones sawmill of San Antonio. Joseph Stiert, of San Antonio, was chief installer and crafted the beautiful wooden screen of cedar that curtains the organ loft, as well as all ceilings of passageways, sacristy, and interior of the church. On December 25, 1942, the first mass was celebrated at midnight and thereafter all principal masses at the Abbey and school were celebrated there, even though windows were yet to be installed. These had been contracted through Karl Mueller, of Melville, N.Y., a stained glass artisan from Munich, Germany, who later, in 1952, moved his studio to Zephyrhills, FL. Installation of the permanent altars in the abbey church and crypt began before the end of World War II, despite the shortage of fuel for transportation. With the exception of the high altar at the rear of the sanctuary, made from Tennessee marble, the altars were quarried and carved of Indiana sandstone from St. Meinrad Abbey. They included the altar dedicated to St, Joseph and the blessed Mother of Jesus in the right and left transept respectively. In the west nave, beginning with the bay chapel dedicated to St. Benedict, the altars are dedicated to the Sacred Heart of Jesus, St. Placidus and St. Boniface. In the east nave, front to rear, the altars are dedicated to St. Leo, St. Maurus and St. Scholastica. The marble statues above the side altars depict the appropriate saint. A feature article at the time, in the Orlando Sentinel-Star, reported that thirty-two truckloads of carved sandstone had so far arrived at St. Leo from St. Meinrad, swapped for sixty two loads of oranges and grapefruit. In the article the reporter dubbed the edifice, the church that orange built. Christmas midnight 1944, was singularly memorable at Saint Leo. In addition to a near full congregation of local worshippers, at the invitation of Abbott Francis, over one hundred German war prisoners, interned at the Pasco Packing Company of Dade City attended the Mass, forming a choir to sing â€œStille Nachtâ€� at the opening of the ceremony. Considerable criticism followed, even editorially in regional newspapers. Despite the adverse publicity, Abbot Francis allowed the war prisoners’ access to the Abbey Church on subsequent occasions as well. As World War II drew to a close, the interior of the church was painted in pastel colors, block by block, to enhance the installation of Byzantine style paintings by Beuronese artist Urban Sprugg, of Vienna, Austria. In addition to three wall-sized paintings by Sprugg in the church nave depicting Christâ€™s Last Supper, the marriage in the Temple of the young virgin Mary, Sprugg also painted murals on the walls of the abbey church crypt, which is used exclusively now for the abbey archives storage. In December, 1945, the long anticipated 23,500 pound Tennessee marble crucifix, on the shroud of Turi, was carved by Tom Watson from Tennessee Rose Marble. Frank Aretz completed the whole panel, including the blue mosaic in 1947, the year before the Church of the Holy Cross was consecrated in January 1948. It is to serve as the focal point of attention on the towering sanctuary wall, arrived by freight at the San Antonio rail station. With personnel and equipment from Pasco Packing Co. of Dade City, FL., the altar tableau-to-be was brought on site and by cable hoist was raised in place at the rear wall of the sanctuary. With the monolith almost in place, the steel cable snapped and hurtled passed the attending workman. Down at an angle came the crucifix, grazing but not damaging the marble altar below, sliding down the marble altar steps without damage, to come to rest with the base on the tile floor. Only a few broken floor tiles testified to the near catastrophe with the massive Tennessee marble crucifix in place behind the high altar, only the Italian mosaic tile topped and framed by the native cedar wood canopy, remained to be done. These were added in the spring of 1947. A massive three manual pipe organ, salvaged from the Roxy Theater, New York City, by the Aeolian Skinner Company remained to be installed. Under the direction of Father Raphael Schouf, headmaster of St. Leo Preparatory School and director of music for both Abbey and school, this was assembled and installed in 1947. The scene was set for the first solemn consecration of an Abbey Church in Florida. After meticulous and careful planning, the date for the consecration was set: January 29, 1948, the feast of St. Francis deSales, patron of Abbot Francis Sadlier. Due to the absence of Bishop Joseph P. Hurley from the diocese, Apostolic Regent of Yugoslavia in behalf of Pope Pius XII, Most Reverend Thomas J. McDonough, auxiliary bishop of the Diocese of St. Augustine, was the presiding prelate and celebrated the Mass and lengthly consecration of the church. Co-deacons for the consecration and mass were Fathers Bernard Weigl and Marion Bowman,sisted by sub deacon Father Gerald Brady, all of Saint Leo. Co-masters of ceremony were Father Charles McGinley and Benedict Weigan of the Abbey. Leading the Gregorian chant for the lengthy celebration, which began at 7:30 a.m., and lasting to mid-morning were Fathers Raphael School, Vincent Crawford, James Hoge, and Stephen Herrman of the Abbey. Prior to the celebration of the mass, the ceremony required all of the ten altars in the church, plus two in the crypt, to be anointed with the Chrism of Confirmation. Also, the nave, cleared of pews for the occasion, had to be traced with a mixture of ashes and soil across its length and breadth in the form of a cross. Eight visiting prelates, bishops, and abbots, accompanied with Archbishop Joseph Rummel of New Orleans who delivered the homily. No provision for cooling was made for the church, since it was designed and basically finished prior to general use of air conditioning. Additionally, the stained glass windows were installed without adequate reinforcement to prevent sagging under extreme heat conditions. Soon the windows began to buckle and sag, especially in the upper area of the nave where the air in the heat of summer reached well above 115 degrees. By mid nineteen fifties it became evident that the problem needed to be solved. Air conditioning was added but the problem remained. Providentially, the solution was found within the Saint Leo community in the person of newly professed Brother Paul Tennis, retired from the U. S. Navy and a skilled artisan. Abbot Marion Bowman, who had replaced Abbot Francis Sadlier upon his retirement April 21, 1954, assigned Brother Paul to learn the art of stained glass crafting and to remedy the problem. Efforts on Brother Paul’s part to salvage the clerestory windows failed, so he was assigned the task by Father Abbot Marion. Brother Paul’s solution is readily apparent to even the casual observer. At once he discovered that the pre-WWII deep blue and red hued glass in the early century realistic art form was nowhere obtainable, so he began with softer colors. As his art took form, in subdued tones of glass, his moral convictions came to the fore in his task of depicting the fathers of the church and the founders of religious orders. As a reaction to the strong resistance to integration of the races in the social fabric of the U.S. in the 1950s, he invested his figures with rigid, moral strength, and even more noticeably, strong interracial skin tones, combining church tradition and social change. Recent restoration and change in both exterior and interior of the church under Abbot Isaac Camacho, installed in office in December, 2007, has both restored the original and enhanced the new. The work of the pioneers, Oliver Hoehn, Karl Mueller, and Urban Spragg retain their grandeur even as the craft of Brother Paul Tennis and recent restorer Robert Palmer enhances their work and induces prayer in faithful monk and devout layman alike.